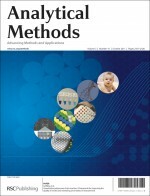 On the cover of the latest issue of Analytical Methods is a minireview from Kate Griffiths and colleagues at the Australian National Measurement Institute. When using quantitative PCR, a calibration curve is commonly constructed from serial dilution of a reference DNA preparation and the test material is quantified by comparison to the curve. There are many factors in this process that can affect the accuracy of the measured value, and there have been some efforts to standardise or optimise this technique as there is ample evidence of measurement inconsistencies. Here, Griffiths et al. present a relatively simple process for estimating measurement uncertainty for quantitative DNA measurements produced by qPCR, with a worked example. This article will be free for 6 weeks.